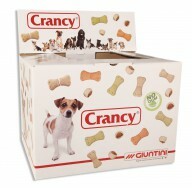 Crancy I Love Dog is a complementary food for adult dogs. 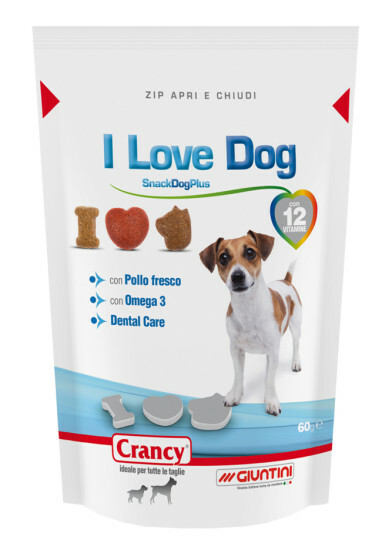 I Love Dog is a tasty snack with fresh meat, fortified with 12 vitamins and a carefully selected insoluble fibre source which helps maintain clean teeth. I Love Dog can be given at any time during the day. Always allow access to fresh clean water. Up to 4 to 20 treats, depending on the size and breed of your dog (up to 4 treats for small dogs; up to 20 treats for large dogs). Crancy I Love Dog cannot replace a complete food for your dog. Cereals, Meat and animal derivatives (fresh chicken min. 4%), Oils and fats, Seeds, Sugars, Minerals, Derivatives of vegetable origin (crude fibre concentrate from natural lignocellulose 0.6%). Crude protein: 15.0%; Crude oils and fats: 11.5%; Crude fibre: 2.5%; Crude ash: 5.0%; Fatty acids (Omega 3: min. 0.4%). Vitamin A: 10,000 IU/kg; Vitamin D3: 1000 IU/kg; Vitamin E: 100 mg/kg; Vitamin C: 70 mg/kg; Vitamin B1: 3.0 mg/kg; Vitamin B2: 4.5 mg/kg; Vitamin B6: 2.1 mg/kg; Vitamin B12: 0.03 mg/kg; Vitamin H (Biotin): 0.02 mg/kg; Vitamin PP (Nicotinic acid): 18 mg/kg; Pantothenic acid: 11.5 mg/kg; Folic acid: 1.3 mg/kg. All dogs need to chew dry snack to help them have strong, healthy teeth. 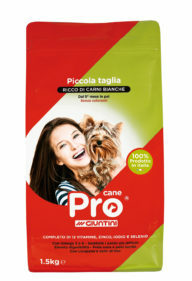 Pro Small breed is a complete food for dogs, rich in white meat (chicken and turkey), nutritionally balanced and highly palatable.